FORT LAUDERDALE, Fla., Oct. 7, 2011 (SEND2PRESS NEWSWIRE) — From October 12 to 14, Southern Arc Minerals (TSX-V: SA) and New Zealand Energy Corp. (TSX-V: NZ) will be making corporate presentations to the South Florida financial community. The two dinners and sole luncheon will include corporate presentations by Bruce McIntyre, President of New Zealand Energy Corp., John Proust, CEO of both companies, and Rhylin Bailie, Vice President Communications & Investor Relations of both companies. Question and Answer sessions will follow all three presentations. Reservations are required. Financial Professionals, Shareholders and Suitable/Accredited Investors need to RSVP via EventBrite below. Wednesday, October 12th @ Villagio Italian Restaurant @ 5:30 p.m. (Downtown Boca Raton, Mizner Park): http://oct12villagio.eventbrite.com/ . Or: Thursday, October 13th @ Chima Brazilian Steakhouse @ 5:00 p.m. (Downtown Fort Lauderdale, Las Olas Boulevard) http://oct13chima.eventbrite.com/ . Or: Friday, October 14th @ Perricone’s Marketplace and Cafe @ 11:45 a.m. (Downtown Miami, Near Brickell Avenue) http://oct14perricones.eventbrite.com/ . LDV Capital Management (www.LdvCapitalManagement.com) is an established Florida Registered Investment Advisory firm, with core competencies in Corporate Finance, Asset Management and Fairness Opinion work. Its services encompass: 1) Mergers & Acquisitions; 2) Corporate Debt Restructurings; 3) Financial Statement Analysis for Companies Preparing for Audit; 4) Financial Advisory, Analysis and Preparation of SEC Registration Statements (S-1, S-3, Form 10); and 5) Financial Advisory, Analysis and Preparation of Private Placement Memorandums (PPM). Its President/Founder, James DePelisi, is six-time President of the 46 year old Stock and Bond Club of South Florida. LDV has received recent acclaim for its monthly corporate dinner events, in conjunction with the Stock and Bond Club of South Florida; and also its annual “Spring Break for Wall Street Growth and Value Investor Conferences”: http://www.ldvcapitalmanagement.com/press_releases.htm . Southern Arc Minerals (TSX-V: SA) is advancing four exploration projects with epithermal gold and gold-copper porphyry prospects on the Lombok and Sumbawa islands in Indonesia, three of which are being advanced in partnership with major mining companies Vale and Newcrest. The Company’s key exploration property is its West Lombok project, with several gold-rich copper porphyry and epithermal gold vein prospects. More information is available at www.southernarcminerals.com or by emailing info@southernarcminerals.com . New Zealand Energy Corp. (TSX-V: NZ – “NZEC”) is an oil and natural gas company engaged in the exploration, acquisition and development of petroleum and natural gas assets in New Zealand. NZEC’s property portfolio covers nearly two million acres over five permits in the Taranaki Basin and East Coast Basin of New Zealand’s North Island. NZEC expects to be in production at its first discovery well by year-end 2011 and will soon drill its first well into the extensive shale formations on New Zealand’s East Coast. More information is available at www.newzealandenergy.com or by emailing info@newzealandenergy.com . For nearly half a century, the Stock & Bond Club of South Florida (www.SBCSF.org) Dinner Association has proven to be one of the largest and most established investment advisory associations in the state of Florida. Over 150 companies have presented before its assembly in the past 16 years, including NYSE listed companies: Gold Corp, Inc. (www.goldcorp.com); Lexington Realty Trust (www.lxp.com); McDonald’s Corp (www.mcdonalds.com); Nokia Corporation (www.nokia.com); Novartis (www.novartis.com); Occidental Petroleum Corporation (www.oxy.com); Pengrowth Energy Corporation (www.pengrowth.com); (SAP AG (www.sap.com); Statoil (www.statoil.com); Tyson Foods, Inc. (www.tyson.com); Watsco, Inc. (www.watsco.com); and Yum! Brands, Inc. (www.yum.com). Web site: www.LdvCapitalManagement.com – Email: Jim@ldvcapitalmanagement.com . 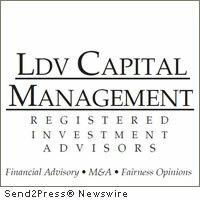 DISCLAIMER: LDV Capital Management (LDV) is a Registered Investment Advisory firm licensed with the State of Florida. The Stock and Bond Club of South Florida is only an industry dinner association and is not registered with any state or federal securities regulatory authority. The information herein is not an endorsement, suggestion or solicitation to invest in any presenting company, but simply a summary of current, recent and/or standard past dinner events. Information mentioned herein is public data, compiled from Yahoo! Finance, a presenting company press release and/or a presenting company’s web site. Information is believed to be reliable, but makes no representation to its accuracy or completeness. LDV does not recommend, warrant, or guarantee the success of any investment or action taken in reliance on statements made in this press release or by any company presentations at any Conference, Breakfast, Lunch or Dinner. Investing, in general, involves risk. As in any investment, part of or all funds can be lost. Due-diligence and professional advice should be sought before making any investment decisions regarding any information mentioned in this press release or content discussed at any breakfast, luncheon, dinner or conference. The term South Florida is roughly synonymous with Gold Coast (source: Wikipedia). Original Keywords: John Proust, Bruce McIntyre, New Zealand Energy Corp, Southern Arc Minerals, LDV Capital Management, James DePelisi, Florida Registered Investment Advisory firm, Corporate Finance, Asset Management and Fairness Opinion work, Stock and Bond Club of South Florida LDV Capital Management Fort Launderdale Florida FORT LAUDERDALE, Fla.
REFERENCES: Banking News, John Proust, Bruce McIntyre, New Zealand Energy Corp, Southern Arc Minerals, LDV Capital Management, James DePelisi, Florida Registered Investment Advisory firm, Corporate Finance, Asset Management and Fairness Opinion work, Stock and Bond Club of South Florida LDV Capital Management Fort Launderdale Florida FORT LAUDERDALE, Fla.